The Digital Innovation Summit at this year’s ACI Airport Exchange will hear from Richard Camman, Business Innovation VP, Vision-Box, who will outline experiences of implementing a biometric-based seamless passenger walkthrough journey at some of the most innovative airports around the world. He shared a preview with Marta Dimitrova. Pioneering airports are embracing digital transformation in their efforts to create a seamless travel experience. Common-use technologies, self-service boarding, and automated border clearance are just some of the areas in which innovation is being driven. “The next step will be to connect the dots, step away from silos, and start building a completely passenger-centric ecosystem, which increases facilitation and security at the same time,” says Richard Camman, Business Innovation VP, Vision-Box. He adds that the focus is on “accomplishing a comfortable, unfettered environment for the passenger, with no obstacles and, even better, without travel documents”. At this year’s ACI Airport Exchange, Camman will describe how Vision-Box, together with some prime examples of passenger-centric modern airports, is implementing a biometric-based seamless passenger walkthrough journey designed to modernise the airport experience. “This new technology will facilitate the entire traveller journey by increasing throughput and eliminating bottlenecks, while expanding terminal capacity within the existing footprint, thus generating substantial financial benefits at all levels of profit and loss dimensions,” he explains. It is a human-centric approach which, in a modern, digitally-transformed world, is firmly focused on the needs of the traveller. The aim is to guarantee a hassle-free and frictionless process that does not jeopardise security. 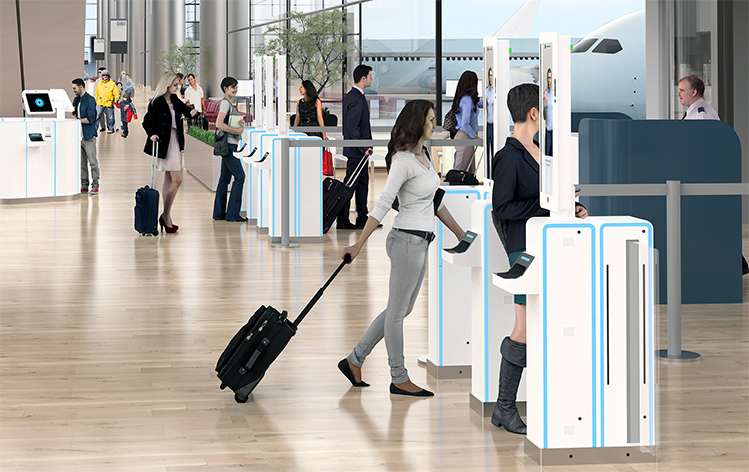 With the addition of paperless biometric boarding gates, Montevideo Carrasco International will become the first fully digital airport in Latin America with a curb-to-gate biometric clearance journey. This translates into a frictionless traveller flow, giving the airport additional flexibility over its operations management and passengers a seamless journey where presenting travel documents becomes unnecessary. Vision-Box is exhibiting at ACI Airport Exchange, where visitors will be able to learn more about its product line for passenger interaction points, specifically designed with modularity, connectivity and low footprint in mind. “Those interaction points are all connected to our common-use passenger flow management platform orchestra™, the brain of the 4.0 Seamless Airport,” says Camman. The company will also demonstrate VBot™, its new smart Internet of Things (IoT) facial biometrics capture device, which provides quick, non-intrusive, contactless and highly accurate facial recognition.